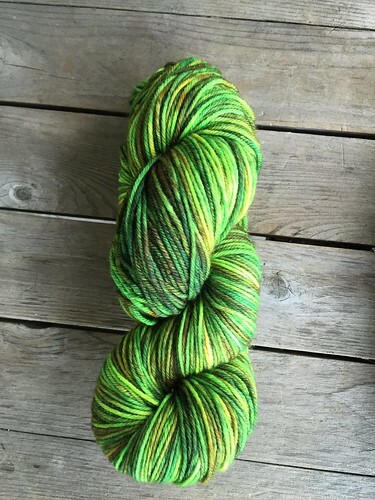 A few weeks ago when I posted a photo of some roving I dyed my friend Lisa said she'd like me to spin it for her. My friend Trish asked if I had dyes to create neon colors. Well, I didn't have the time or inclination to spin that roving up for Lisa but I did have a partial cone of Henry's Attic Kona Superwash that has been in my stash for a really, really long time. I had enough to skein up 315 yards for each of them. First, for Lisa, I tried to replicate what I had done on the roving. I don't take any notes when I dye. I just slosh on dye until I like it. I ended up with a yarn that wasn't as bright as the roving but I think I like it more than the original. This was done in a crockpot. I just poured in layers of color until I thought it was done. 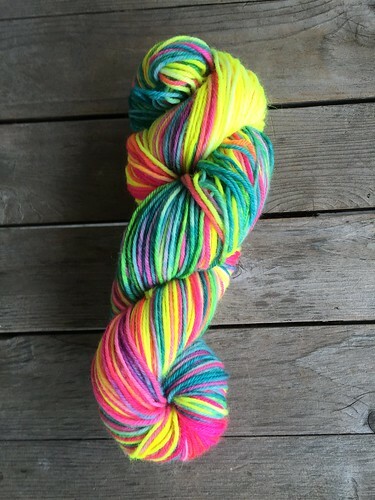 For Trish, the neon lover, I decided to hand-paint a skein. I laid out plastic wrap and took my three primary dye colors, Polar Yellow, Cyan and Magenta, and mixed a jar of each with some vinegar and water. I needed enough water to get all the yarn thoroughly wet with color but enough vinegar for the dye to stick quickly instead of migrating and making muddy colors. Once the skeins were dry I reskeined them to mix the colors up a bit more for a nice presentation. I was able to send them to their new homes last night. I'm excited to see what they make from them.